New Orleans Square is a little tucked-away area that few appreciate. Most people know it as “that place you walk through when you get off of Pirates of the Caribbean and also when you eat at the Blue Bayou.” But Walt designed it to be an actual street—well, couple of streets, and they’re especially cool at night. There’s a hidden court back there that I will blog about later, and several stores. One opening on the court is Le Bat En Rouge. Is that an awesome sign or what? The signs in New Orleans Square are all pretty cool, and this one is no exception. Le Bat en Rouge is a tiny store located on a corner with a supercool exterior. Now you’d expect Le Bat En Rouge to carry lots of red items, but it doesn’t really. 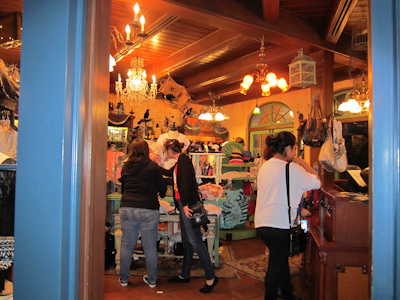 It’s just a small clothing store without very much theming inside, unlike most of the other stores. I didn’t get a chance to really take a lot of pictures in there, so you’ll have to deal with these. Sorry! Here’s what it looks like from the hidden court. Ah well, at least the front is cool. MMkay. 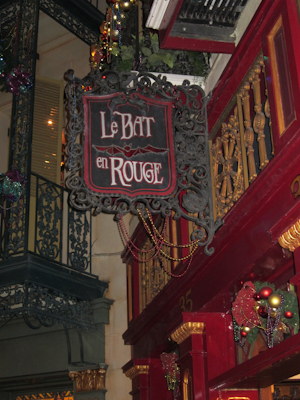 Help me out here, but didn’t Le Bat en Rouge used to be a store that sold various Halloween-like items? Possibly marketed alongside The Nightmare Before Christmas? A few of the shops in Disneyland that used to sell specific wares — I’m also thinking of the hat shop — are now just selling generic Disney apparel and while I understand that general apparel sells better than niche stuff, it’s kinda sad to have fewer “specialty” shops within the park. At any rate, the storefront is lovely. 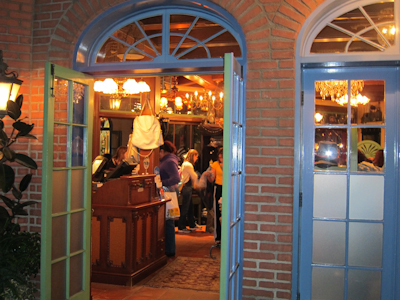 Who doesn’t fall in love with the shops in New Orleans Square? 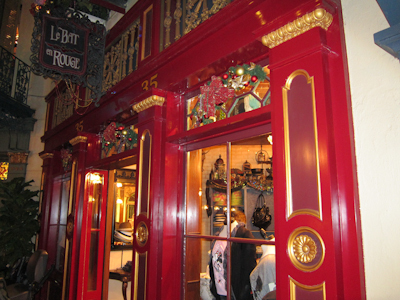 I’m not sure if that merchandise was once housed in Le Bat en Rouge, but it’s now sold in a different, larger store in New Orleans Square :). New Orlean’s Square is one of my favorite places in Disneyland. That is one of many reason I prefer Disneyland over The Magic Kingdom in Florida (where they don’t have it).